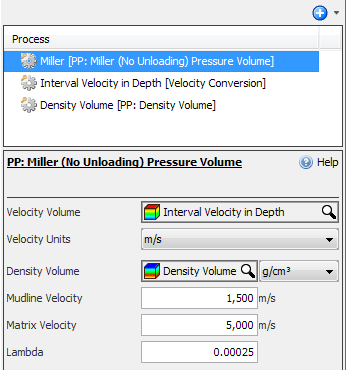 Description Calculate pressure (in psi) and pressure gradient (in ppg) using Miller's equation (without unloading). The Miller equation is a technique used to estimate pore pressure in 3D using the effects of the matrix and mudline velocities. Depending on whether unloading has occurred, the Miller equation takes a different form. This process creates new volumes of pressure (in psi) and pressure gradient (in ppg) using the Miller equation without unloading. To fully read and understand the fundamental theory behind pore pressure analysis and Miller's equation, see the Pore Pressure Prediction chapter. Miller's method defines a relationship between velocity and effective stress that can be used to derive pore pressure from velocity. The advantage of Miller's method is that both the effects of the matrix and mudline velocities are considered on pore pressure prediction. There are two forms of the Miller equation, depending on whether unloading has occurred. This process implements only the "no unloading" form. 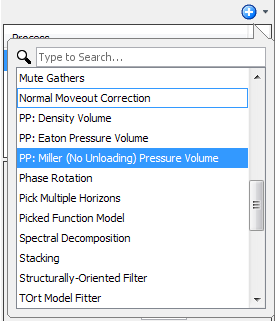 Double-click PP: Miller (No Unloading) Pressure Volume. 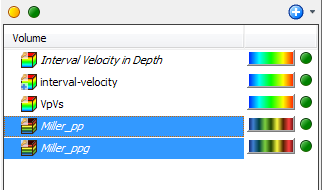 Type a new name for the process and click OK.
Velocity Volume — A 3D volume of interval velocities in depth. If you have a velocity model of another type, use the Velocity Conversion process to transform it to Interval Velocity (Depth) (after which we recommend that you QC it, to verify that the interval velocities are sensible). Note: Velocity volumes should start from the seismic reference datum. If the depth the velocity starts is not consistent with the project's reference datum, see Configure a Project to change your project's seismic reference datum. Density Volume — A TVD volume of densities, generally created using the PP: Density Volume process. These densities are integrated to calculate Overburden Gradient (OBG). Mudline Velocity (Vml) — The compressional velocity in the mudline (i.e. the sea floor or ground surface, normally approximately 1,500 m/s or 5,000 ft/s). Matrix Velocity (Vm) — Interval velocity in the matrix of the shale (i.e. asymptotic travel time at infinite effective stress, approximately 4,000-5,000 m/s or 14,000–16,000 ft/s). Lambda (λ) — The empirical parameter defining the rate of increase in velocity with effective stress (normally 0.00025). As a result of this process, the pore pressure and pore pressure gradient will be added in the Volume tab. Zhang, Jincai, 2011, Pore pressure prediction from well logs: Methods, modifications, and new approaches. Earth-Science Reviews, 108, 51-62.